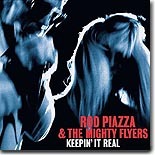 Rod Piazza & the Mighty Flyers are back with their first new album in three years. It's this month's Pick Hit. Texas guitarist Pat Boyack gathered some of his Austin music friends in the studio to record his favorite soul/blues/R&B tunes, both covers and originals. The result is a very entertaining CD, Voices from the Street, is our Surprise pick for this issue. One of the great soul songwriters, Dan Penn, stepped out with his own fabulous CD, Do Right Man, in 1994. It's featured as this month's Flashback. This month's What's New section features new releases from Paul Geremia, Charlie Musselwhite, Tinsley Ellis, Easy Bill & the Big Beat, Floyd Lee, Dr. "Feelgood" Potts, Sheba Potts-Wright, Popa Chubby, the subdudes, Otis Taylor, Eric Bibb-Rory Block-Maria Muldaur, and more.